Since 1972, the Thomas Family has proudly served the Kern River Valley’s waste management and storage needs. 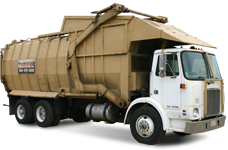 The Thomas Family Companies consists of our parent company, Thomas Refuse Service and our sister company, Sierra Waste Transfer. Whether you are a residential or a commercial customer, you can count on us to provide you with excellent service and affordable pricing on solid waste handling that includes Blue Bag Recycling, septic and grease trap pumping and, portable toilets rental and service. In addition to our customer service, we have a strong commitment to our community and believe in investing in it to keep the Kern River Valley beautiful and strong through events like Kern Valley Pride Day, college scholarships and donations. 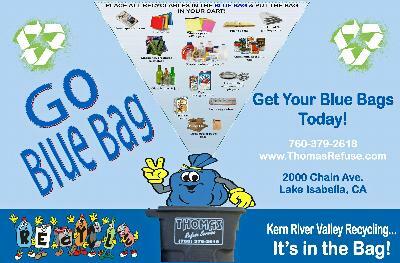 Recycle for FREE with our Blue Bag Program!!! Blue Bag Recycling is a free and easy service available to all of our commercial and residential solid waste customers. Upon request you will receive a roll of 36 gallon blue bags that allows you to put all of you recyclables from plastics to cardboard into that you then will put into your trash cart/bin. No more having to remember if it's recycle day because now every service day you can recycle! Your efforts to separate recyclables from the trash will have a positive impact on our landfills and assist our County in meeting the California diversion goal! It's not all trash - learn how you too can complete the cycle! 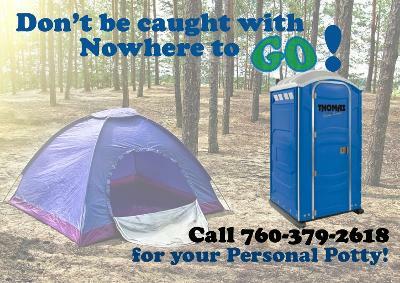 No matter what your septic or portable needs may be, we can handle the job. We pride ourselves on providing excellent service and affordable prices. Copyright © 2009 - 2019 Thomas Refuse Service. All Rights Reserved.